It seems as though my almost-four-year-old is always hungry these days, but never as much as she is after a day at pre-school. The learning and playing and sand box fun depletes her inner resources and she'll ask for snack after snack, even after lunch, and will still eat a full dinner. 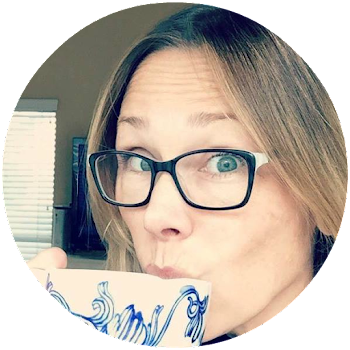 How to get real, fresh, vitamin-packed foods into her body and stop myself from reaching for the snack jar filled with packaged goodies? 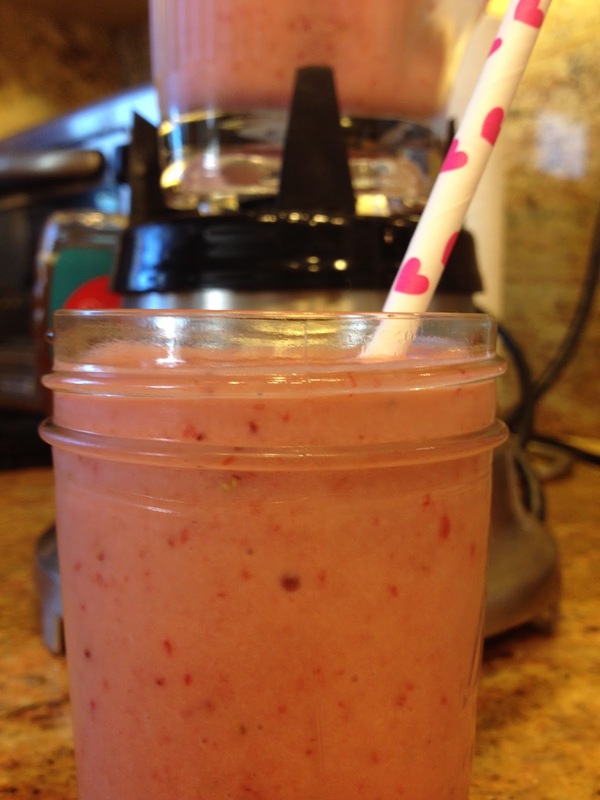 A simple smoothie often does the trick. 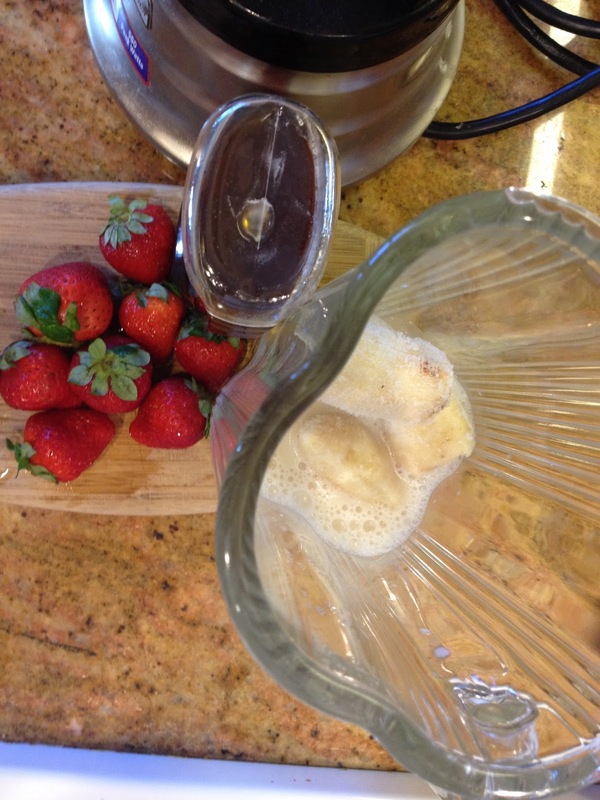 Because the little one is sensitive to dairy, I use almond milk and bananas to thicken the shake. 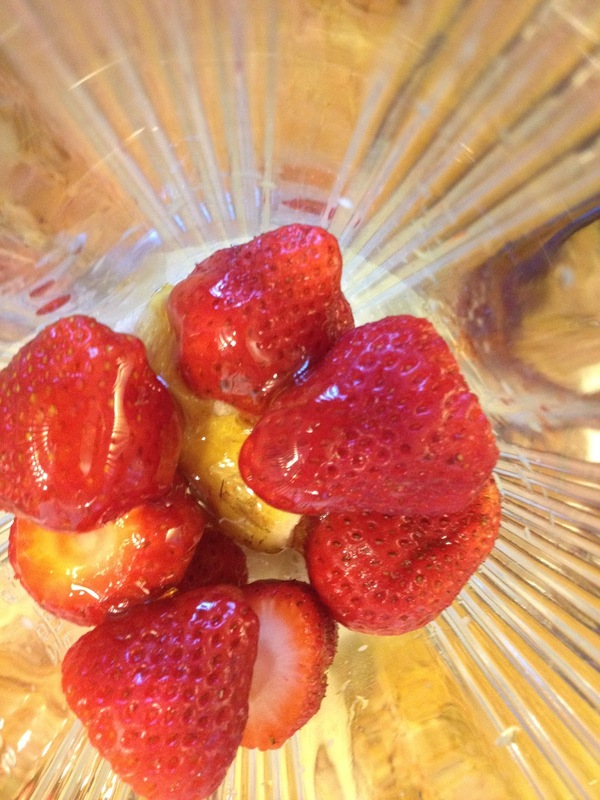 She asked for strawberries, although I might have added a tablespoon of peanut butter or cocoa, too, as noted above. I use the pitcher of the blender to measure 8 ounces of the almond milk and place everything on top of that. And, voila! One happy, healthy kid! 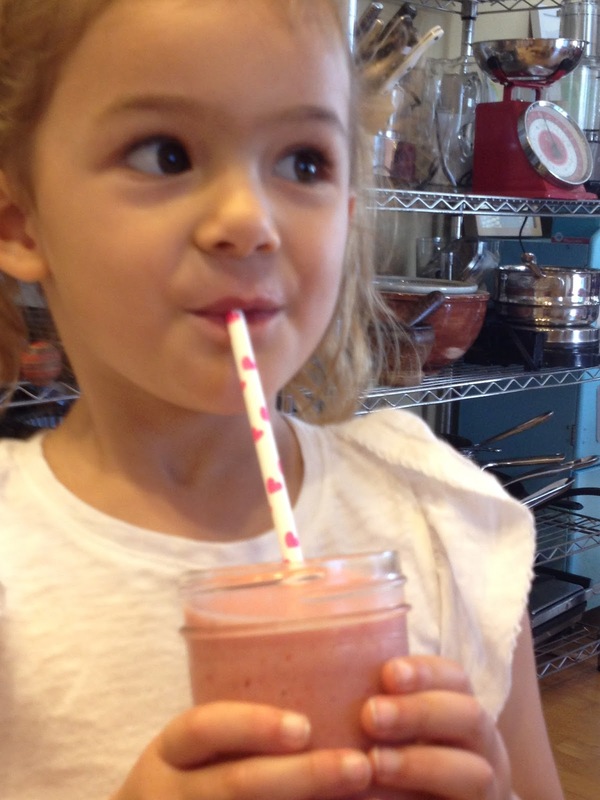 What do you give your little ones as healthy snacks? I could use the tips! There are days that all a girl really needs is a spoonful of chocolate. Not just a Hershey kiss, but an intense shock of soft, gooey, deep, dark, decadent chocolate with a light vanilla finish. On those days, I revert to my childhood pleasure of homemade brownies. After years of working from various recipes, I've found this particular grouping of ingredients creates my favorite flavor and texture profile. Oven to 325. Butter and flour (or cocoa, see below) one 8"x8" square pan. First, I gather my mise en place a.k.a. the ingredients. 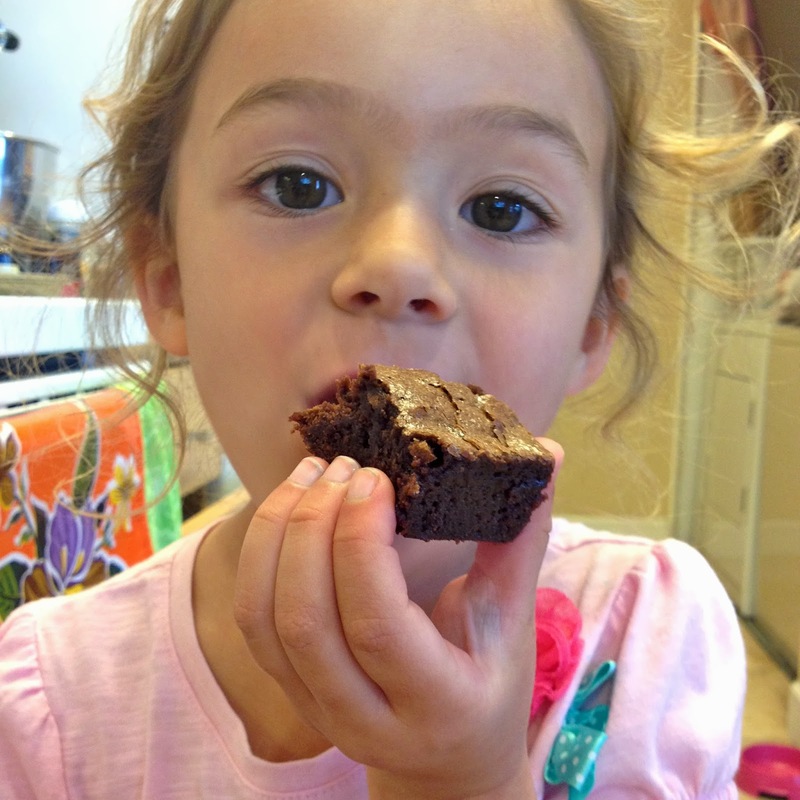 The great thing about brownies is they really are the simplest of treats. Butter, sugar, eggs, chocolate, vanilla, flour and a sprinkle of salt are all you need. The suggested additions are nice-to-haves and I used none of them today. Any good recipe will tell you to melt the butter and chocolate over a double boiler on medium low heat, but I like to melt the butter first and add the chocolate once the butter is almost all melted. 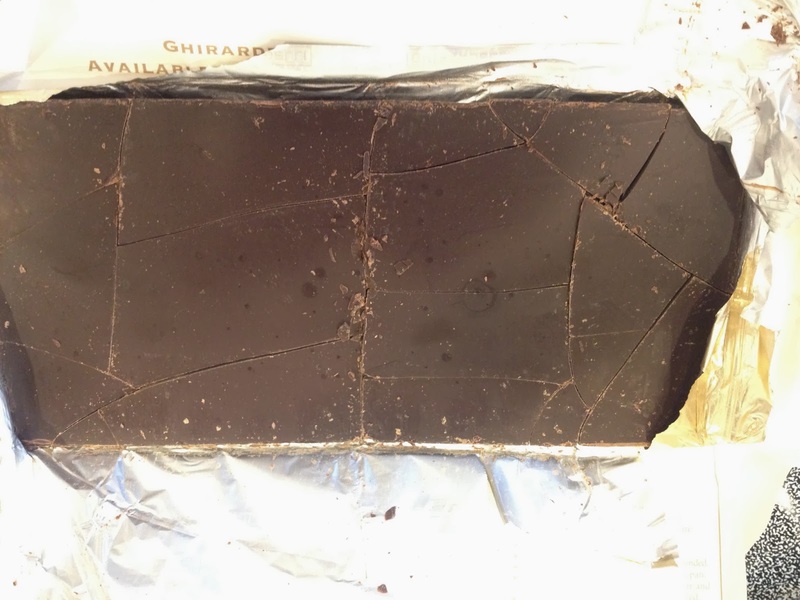 And, I break the chocolate up as much as I can before tossing it in. You can also melt butter and chocolate together in the microwave. For that, follow the directions on your chocolate wrapper or box. By tossing the chocolate into the warmed butter, it can melt on contact as opposed to heating simultaneously with the butter. 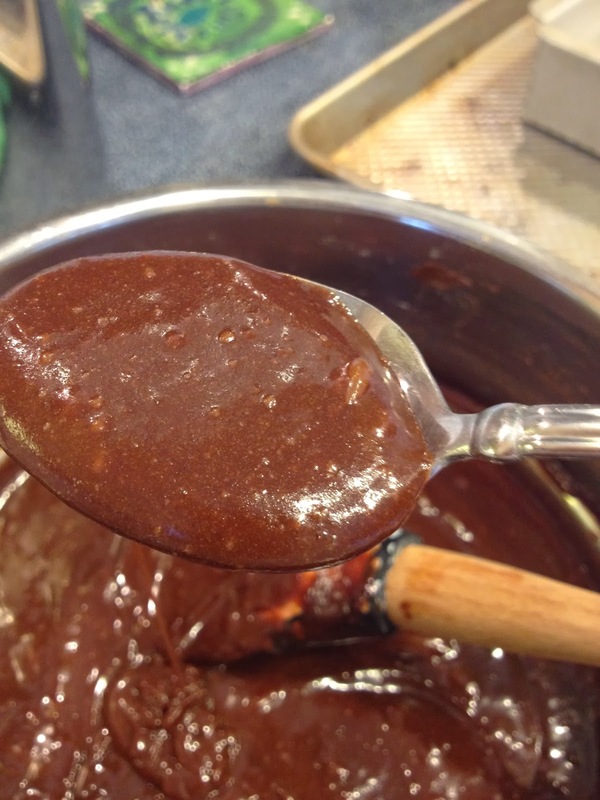 If you ever make ganache, it's the same concept as heating the cream and adding the chocolate to that. But, I digress. 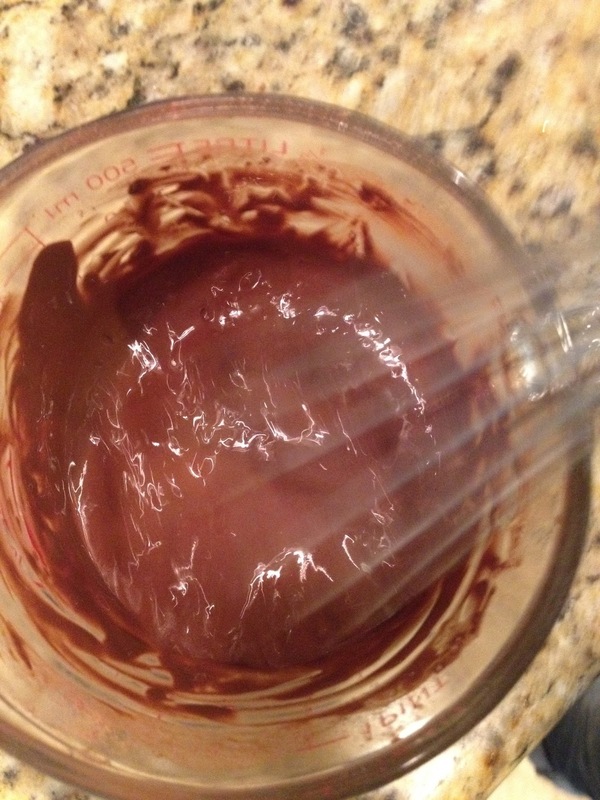 Once the chocolate is all melted in, take the mixture off the heat and let it cool about 5 minutes. Then, add the sugar. Make sure the sugar is nearly dissolved before adding the eggs. In fact, stirring the sugar in can take up to 5 minutes by hand (which I recommend) and can feel a little like a workout. 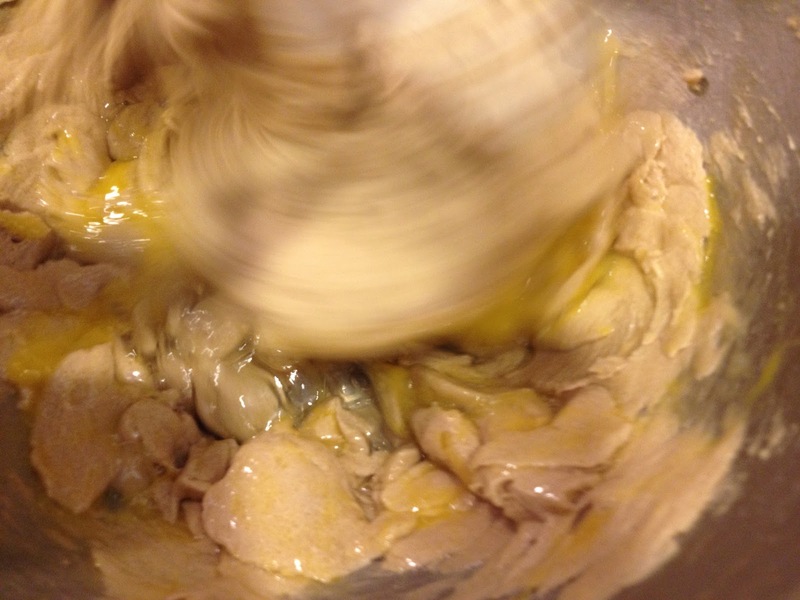 The eggs should be at room temperature and make sure to break them into a measuring cup first to eliminate any chance of shells making their way into the batter. 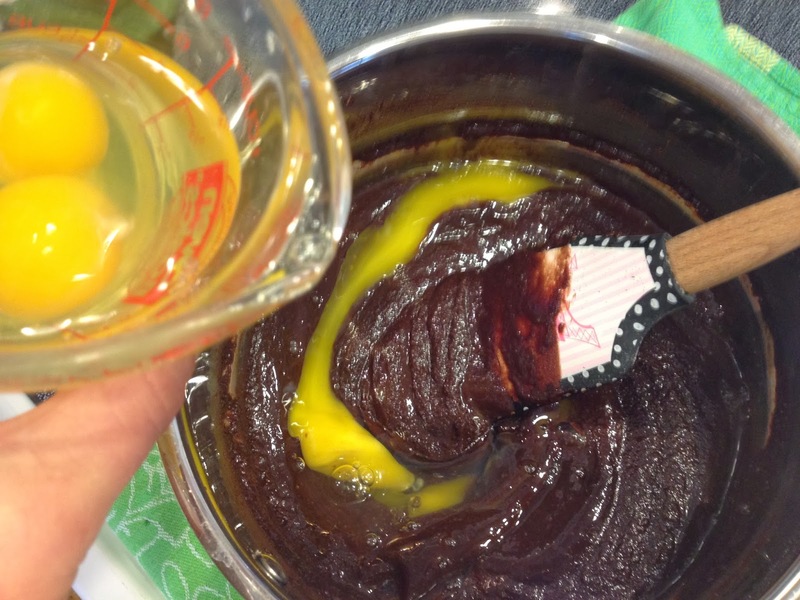 For brownies, always add the eggs one at a time, fully incorporating each egg before adding the next. Once all the eggs are nicely mixed in, add the vanilla and salt. Another tip - I learned this from Joanne Chang in her excellent baking book Flour - is to always fork-fluff your flour before measuring it into the cup. It lightens the flour to its intended consistency. 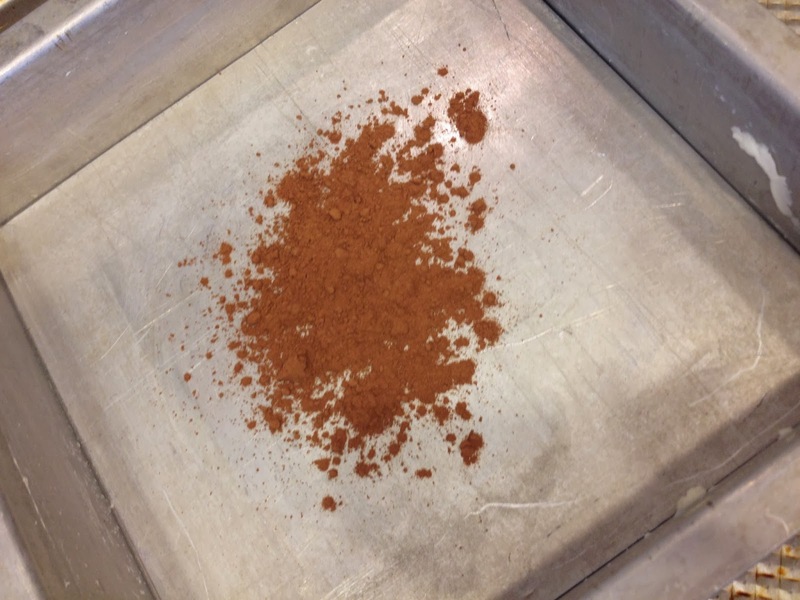 Once the flour is mixed in, one naturally takes a bite. 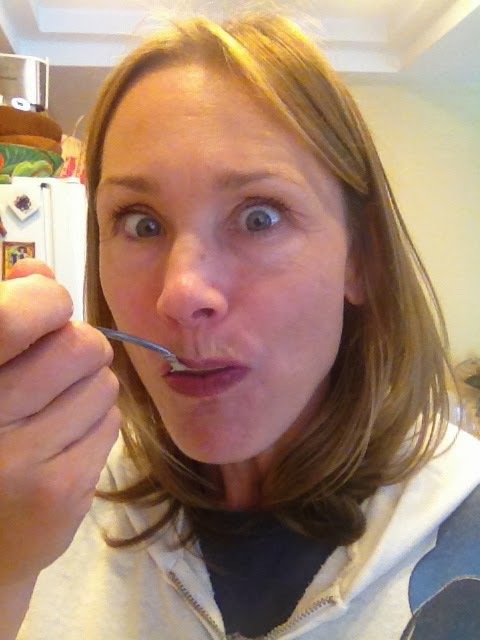 The reason I do it to begin with lies in the melty goodness of this spoon's contents. Really, I cannot help myself. 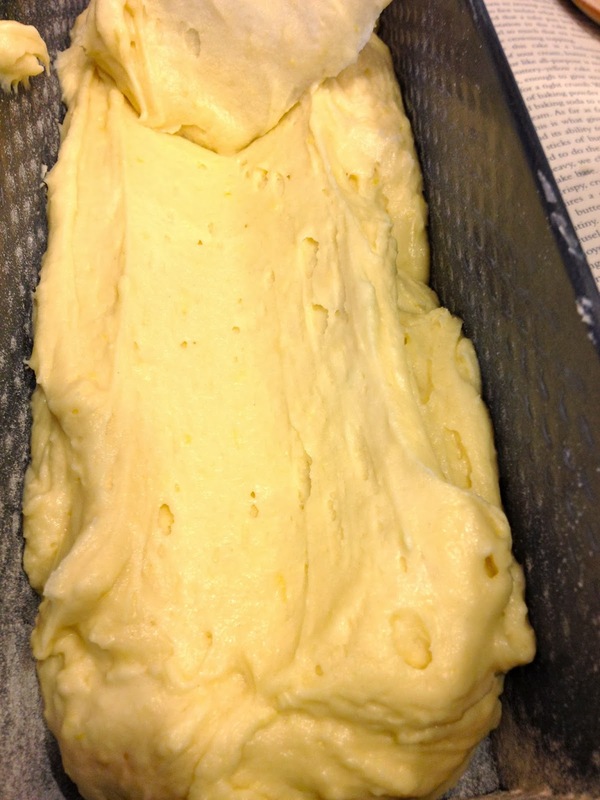 Now the batter is ready to go into the pan. Rather than use flour, I add a tablespoon of cocoa on top of the buttered pan. You'll want to distribute this evenly across the bottom and sides of the pan like so. And bake. These took 32 minutes at 325. Here comes the hard part: waiting for these puppies to cool down enough to slice. 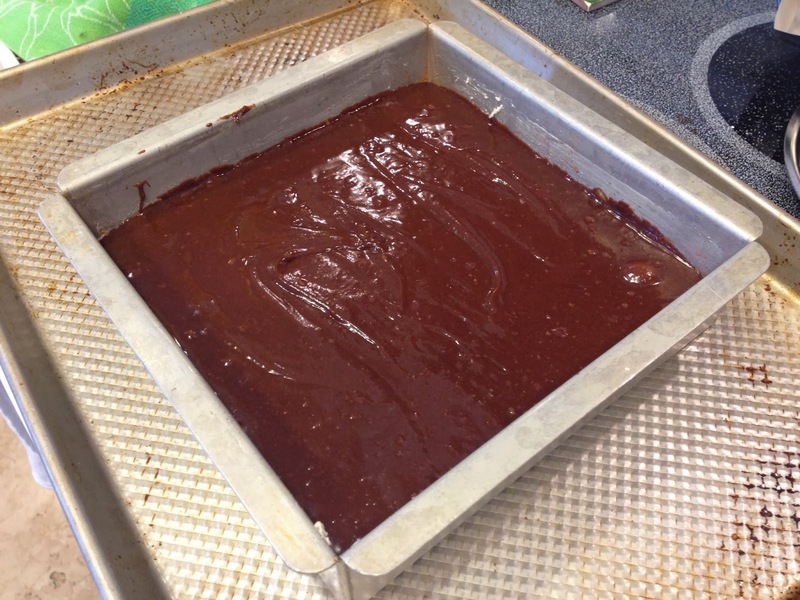 Brownies have to cool at least most of the way to room temp before you can cut them. You can either leave them on the counter about an hour or put them into the fridge roughly 30 minutes. If you want your brownies to be in perfect little squares, you probably have to wipe down your knife between slices. I just use a paper towel for that. These brownies are indeed rich and are intended to be eaten in smallish quantities. 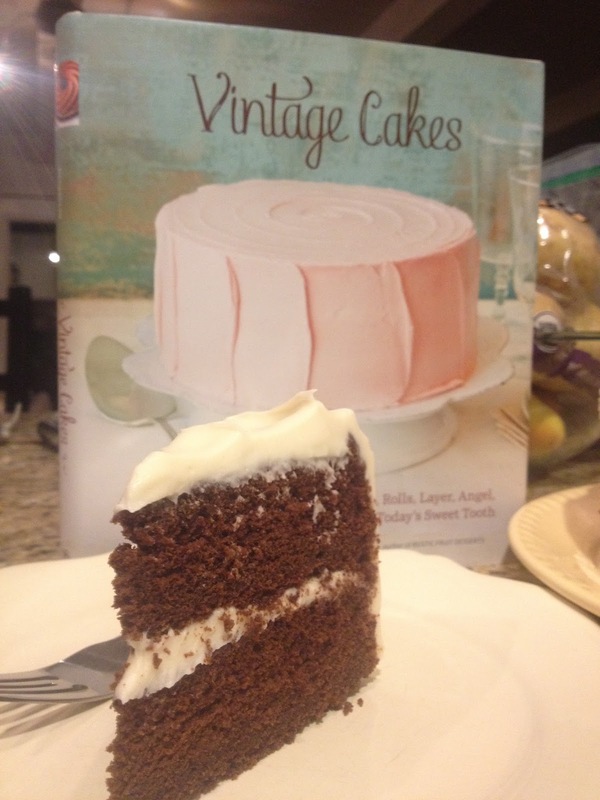 But, if you wanted to cut the richness, you could always top them with a scoop of Vanilla Haagen Dazs! Okay, well, my work here is done. Enjoy and please let me know how yours turn out! This past weekend my husband and I got our moms together for dinner in our new place. As the two of them get along famously, we knew it would be a lively evening. But because my cooking skills are still in development (read: not great) I turned most of my attention to dessert. What to concoct for our sweet mothers on a cool evening in February? Dinner would be Braciola (an Italian flank steak roulade in marinara sauce) with pasta, so I wanted dessert to be something light but also full of flavor. What would brighten the end of the meal and lift the palate? Lemon cake, of course. Pulling out my trusty "American Classics" by the editors of Cook's Illustrated, I found the perfect lemon pound cake, bought some raspberries and heavy whipping cream and got started zesting lemons. The recipe smartly calls for blending the sugar with the zest before doing anything else, ensuring a fragrant batter. Once you've got that done and the wet ingredients whisked in, the flour gets added a little at a time - in maybe 3 or 4 batches. This eliminates lumps and makes for a light, fluffy cake. I always make sure to generously butter and lightly flour the pan. And, I may be a wee bit meticulous about evenly distributing batter because, you know, perfect-looking cakes taste better, right? Umm, so, I was so excited about putting it all together that I may have forgotten to take a photo of the final cake (oops!). 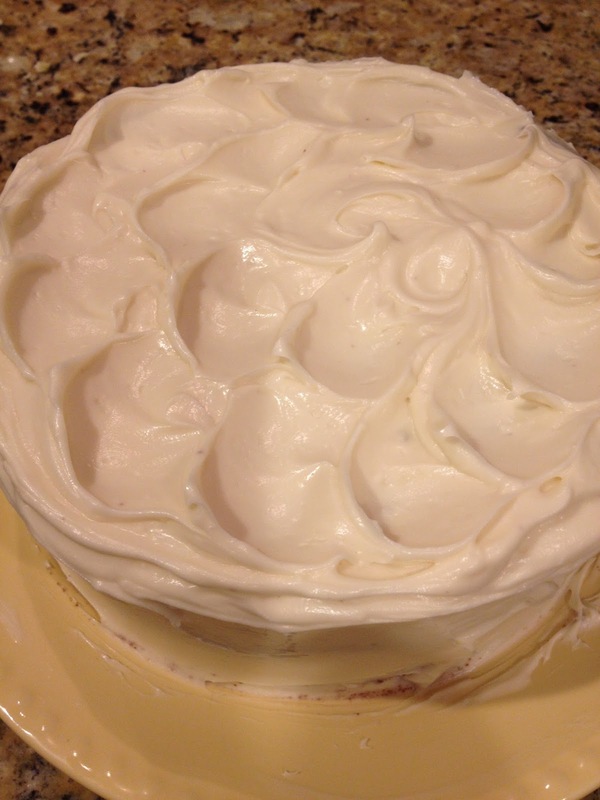 Once the cake was out of the oven, I poked tiny holes in the top and poured a glaze of sugar and lemon juice that had been marinating for the hour the cake was baking. Making holes causes the glaze to seep down into the soft cake, adding a burst of lemony flavor in every bite. The glaze is my favorite part and I could eat it by the spoonful (I have a high sugar tolerance, though). You can even add a couple of tablespoonsful of the glaze to sparkling water for a very special lemonade treat. Back to the cake! Now, it was time to rinse berries and make whipped cream. I reeeeally recommend whipping your own cream as the flavor and texture really are so decadent and make all the difference. This time, I added about a tablespoon of vanilla bean paste to about a pint of fresh heavy cream. 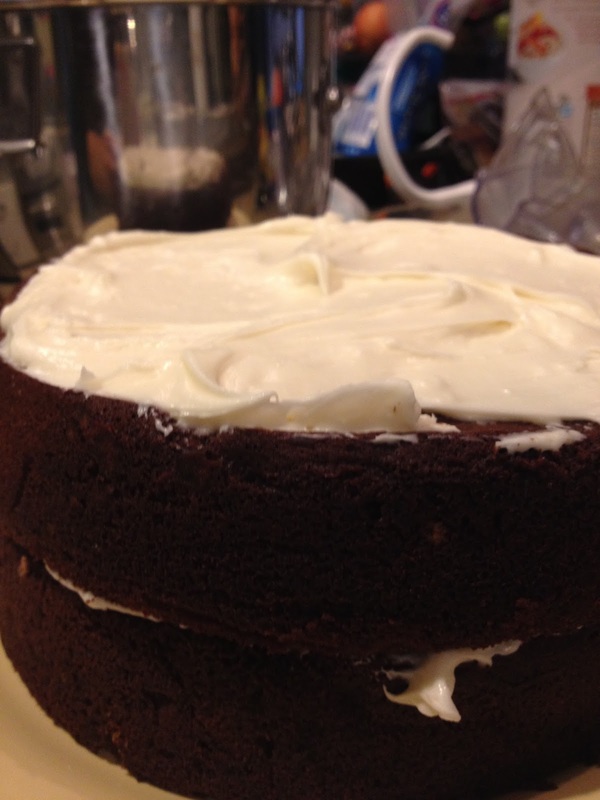 Because vanilla bean paste has sweetener in it, the cream needed no additional sweetening. I mean, I like sweet, but you want to be able to experience the range of flavors. Adding fresh berries to little slices of cake and wholloping the whole thing with a heap of real whipped cream made for a delicious finish. Now, I know these are my moms, but they did claim to love it and everyone gobbled it up in no time, despite a fairly heavy dinner. This is the kind of cake you can serve at tea time, bring to a new neighbor, freeze, eat for breakfast - really, it's so versatile. If you like lemon, you'll love this. And, now, for the recipe! Butter and flour a loaf pan. I like to use 4.5"x12" but a 9"x5" will totally work. Heat oven to 325. Blend the sugar and the zest in a blender or food processor about 5-6 pulses. 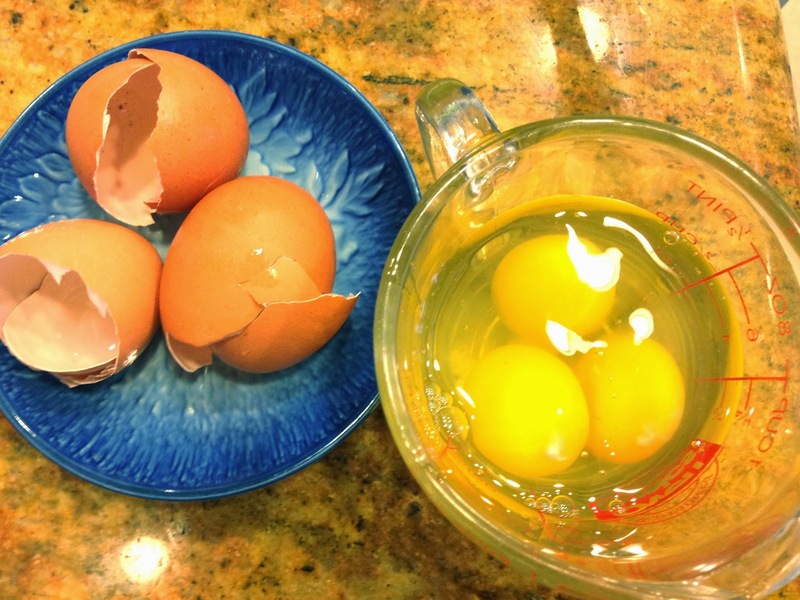 Then, add eggs (I always break eggs into a measuring cup to make sure to catch any shells before adding to a batter), vanilla and lemon juice and pulse 7-10 times, until incorporated. 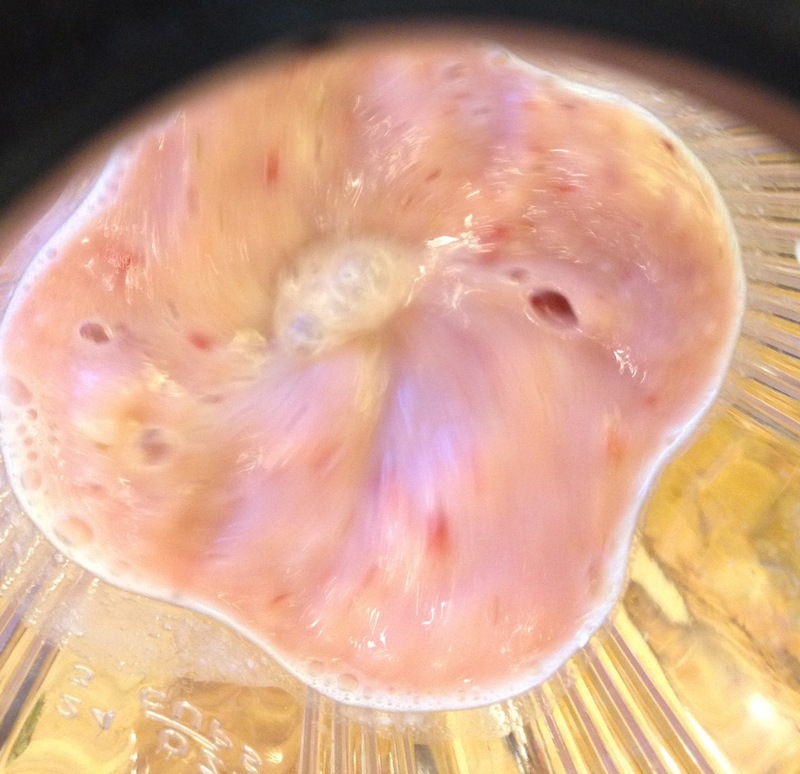 Turn your blender/processor on and slowly drizzle the melted butter in over about 10-15 seconds. 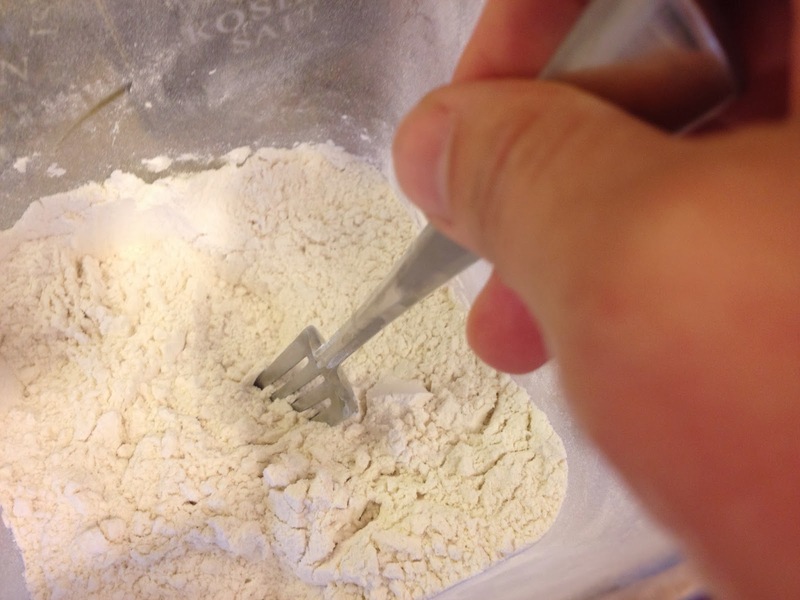 Transfer the wet mixture to a large bowl and gently whisk in 1/3 the dry mixture. 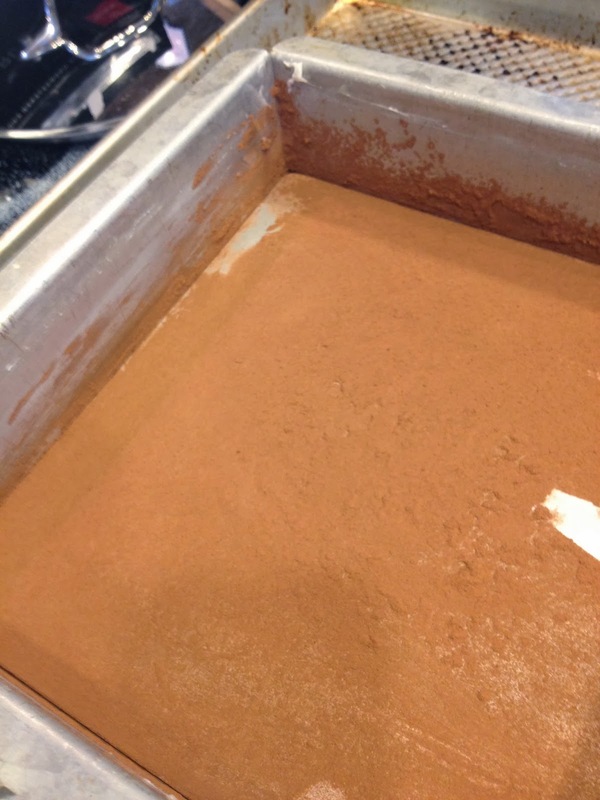 Repeat until all of the dry mixture is incorporated, but don't overmix. Bake 50 minutes, until the top of the cake is set, although it may still be glossy and look slightly underdone. Let it cool about 15 minutes and then add the glaze. Mix lemon juice into sugar and whisk. Then, repeat about every 15 minutes for about an hour. The sugar will naturally mostly dissolve, leaving a few soft sprinkles of sugar crunch that make a nice, soft crust atop your cake. 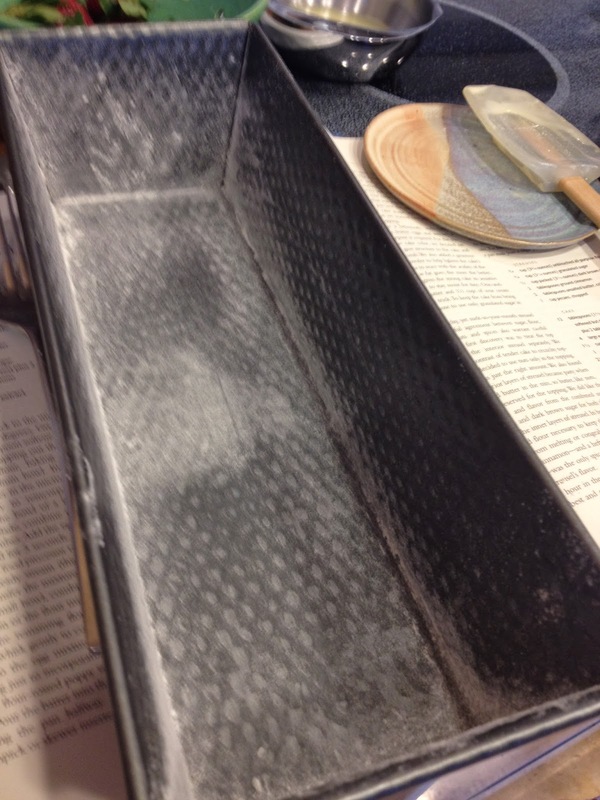 Keep your cake in its pan and poke lots of holes in it - gently! I use a fork with long tines, but you can use toothpicks or kabob sticks. Slowly pour the glaze over the warm cake. I usually take 3-4 passes at this, letting part of the glaze settle in each time and then pouring a little more over. Let the cake sit at least 30 minutes and then pop it out of the pan. Slice with a sharp knife if you're serving it fresh or, if you have time, refrigerate the cake to solidify the crumb. As I recommend above, drop a few berries (enough so that each bite of cake can be accompanied by a berry and some cream) on a slice of cake and then douse it in whipped cream and you're good to go.